October 1, 2012 - For a second time in three days American Airlines is faced with serious maintenance issues with its aircraft. In both incidents the aircraft seats came loose from its track while in flight. Today American Airlines Flight 443 out of New York's John F. Kennedy Airport for Miami had to return back to New York after a row of seats came loose from its track. On Saturday American Airlines aircraft Flight 685 out of Logan International Airport in Boston for Miami was diverted to JFK due to a row of seats that as well came loose from its track. In both incidents passengers were moved to other seats, no one was injured and the aircraft landed without further incidents. Today’s incident delayed passengers for three hours before they were put on another flight for Miami. An American Airlines spokesperson stated the airline does not believe this is related to its ongoing labor issues. Last month it was reported that American Airlines had a number of flight cancelations and nearly 40 percent of its flights were delayed due to maintenance issues. As a result of today’s maintenance issues with its seats coming loose from its track American Airlines has taken 8 Boeing 757 jetliners out of service. The FAA has reported that the airline has found other aircraft with similar issues with its seats not being properly secured. In all of these aircraft each plane has had prior maintenance work done in which the seats were removed from the aircraft and then re-installed. It appears that in these cases the seats were not properly secured by maintenance personnel. 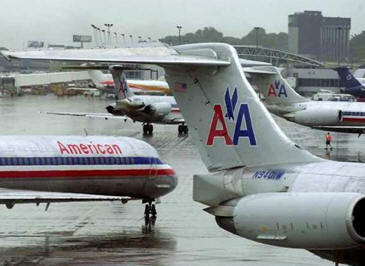 A spokeswoman for American Airlines said the airline is conducting an internal investigation and that the carrier believes that there could possibly be an issue with a certain model of seats and how they fit into the tracking used to secure the seats. "Out of an abundance of caution, American has decided to proactively re-inspect eight Boeing 757s today that could possibly have this same issue. The seats were installed by American maintenance and contract maintenance. The issue does not seem to be tied to any one maintenance facility or one workgroup. "This afternoon, the company flew engineers, tech crew chiefs, and inspectors from its Tulsa maintenance base to New York to evaluate the aircraft and determine the next course of action to correct the problem. We are in contact with the FAA. They are aware of our internal review." Back in mid September American Airlines had reported it would begin to outsource its aircraft maintenance to China and layoff more than 1,000 American maintenance workers. American’s maintenance issues could not have come at a worse time. Its pilots, maintenance personnel and others have argued against this move sighting safety concerns. Foreign maintenance facilities are not required to have licensed mechanics nor required to do background checks on their personnel. In addition the FAA does not make spot checks and surprise inspections of these foreign maintenance facilities which is a common occurrence at U.S. maintenance facilities. In November American Airlines filed for bankruptcy with over $2 billion in cash in its bank accounts. In January American Airlines retained the service of Bain & Co., the consulting firm in which Mitt Romney worked before co-founding his private equity firm Bain Capital. Back in February American Airlines announced it intended to cut its labor costs by 20%, eliminate 13,000 jobs, replace its pension plans with 401(k) plans and end company-paid retiree healthcare. When American Airlines filed for bankruptcy under Chapter 11 it then allowed the company the opportunity to reject any of its employee’s prior collective bargaining agreements under Chapter 11 section 1113 (11 U.S.C. § 1113).